Do you have empty rooms or rooms with old or shabby furniture? You can rent furniture and accessories through a furniture rental company that will significantly update the look and appeal of your home, especially if you have furniture more than 6 or 7 years old. If you don’t want to pay a stager to spend several hours in your home bringing in and styling their own accessories, bedding, lamps, florals, towels, and decorative items, but you want help figuring out what furniture and/or accessories to rent and where and how to place them in your home, call me at 201-390-4649. For a $100 consultation for 4-5 rooms, I take all needed measurements as well as photos of existing wall colors, carpeting, columns, angled walls, etc. so that I know what size, upholstery choices, and number of pieces will work best in each room. For just $50 extra per room, I can provide you with a specific list and photos of furniture, area rug and accessory recommendations from one of 2 or 3 local furniture rental companies. I can even make the initial contact and arrangements with them, if you wish, or you can contact them directly, but you will sign the contract with them and take delivery and direct the furniture placement. 1) Clean it thoroughly or better yet, have it professionally cleaned. A clean home, just like a clean hotel room, is critical to impressing buyers! Don’t forget to clean carpeting and floors as well as around faucets and tile grout and around all light fixtures and window sills. 2) De-clutter your home of all knick-knacks, papers, toiletries, small items on floors — including shoes, baskets, dog beds, dog toys, fish tanks, excess items on countertops. 3) Remove excess furniture and/or re-arrange furniture to highlight the best features of your home (large windows and fireplaces, for one). Especially be sure not to block those selling features with furniture, treadmills, large lamps, etc. 4) Remove fussy, frilly, dark, floral drapes and valances or any other heavy window treatments. The only fabric window treatments that are in vogue these days when selling are simple to-the-floor lightweight panel drapes pushed to the sides of windows to let in as much light as possible. 5) De-personalize both your decor and your paint colors. Stagers know what colors are currently popular and neutral enough for buyers AND which ones will work best with your home’s finishes (floors, cabinetry, countertops, tile, and all the non-movable items). Eliminate themed decor, such as western, country, beach, tropical, southwest, etc. 6) Update light fixtures, hardware, bathroom fixtures, appliances where needed (stainless steel is still very popular in kitchens, and brushed nickel or chrome are still the leaders in bathroom faucets). If your competitors’ houses all have granite or marble countertops instead of formica or Corian, then yours should too! 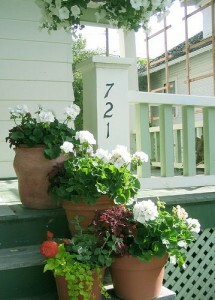 7) Last but actually FIRST to buyers who drive by your home is to spruce up the curb appeal! Paint or clean the front door and trim as needed. Adding a new large door mat, new house numbers, mailbox and large pot(s) of either evergreens in winter in New Jersey or flowering annuals in the summer will attract buyers’ eyes and make a great first impression!